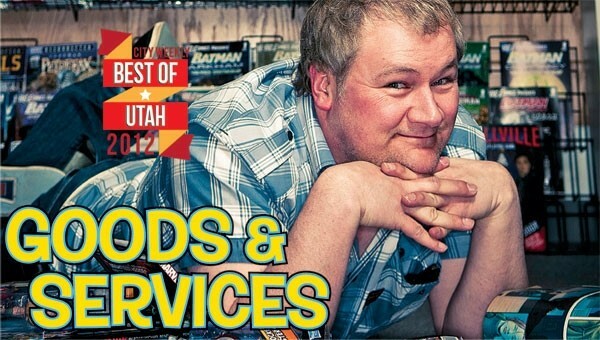 Dr. Volts is a fixture of the local geek culture in Salt Lake City and surrounding parts. On any given Wednesday, you’ll find Salt Lake City geeks—including X96 Radio From Hell’s resident geek, Kerry Jackson, pictured above at the store—filing in and out, picking up their weekly drug of choice: comics. Dave Landa and his staff are friendly, knowledgeable and will get just about anybody hooked on comics. And for those of you buying digital comics, you can still support your local store—just click the link on the Dr. Volts website. Caleb and Hillary Barney have already established themselves and their gallery/apparel store as one of the biggest hotspots in the city for experimental and local-culture artwork, but this past year, the gallery expanded on two fronts. First, it became a shop for the alternative Utah Jazz fan with the now infamous “Jerry” T-shirts that have been popping up at games and on TV. Second, it’s expanded to include books and literature of artists and designers from around the country that normally wouldn’t have a spot in a Utah book store. We can only wonder what they’ll add next. More than simply a pet (sorry, “companion”) supply store, The Dog’s Meow goes several extra miles for the welfare of our furry friends. In addition to providing storefront space for local nonprofit adoption groups, it also hosts donation drives to help feed mouths at places like Salt Lake County Animal Services and holds free quarterly nutrition seminars to ensure that your cats and dogs eat healthier than you do (the staff also dispenses nutrition info daily). And don’t forget the impressive array of food and “fun stuff” on the shelves—if PetSmart is Walmart, then The Dog’s Meow is Whole Foods. The art of handcrafted violins dates back to the 1560s in Northern Italy, but gone are the days of student apprentices. Now, many would-be violinmakers venture to Utah’s Violin Making School of America—it was America’s first school of its kind, and is one of just three other established American schools. Students come from all over the world to attend classes in the three-year program. They learn to whittle wood into something that sounds as beautiful as it looks, all while surrounded by wood shavings and the smell of linseed oil. And, most important of all, these students are keeping this art alive. Pretty You Boutique drew ire in conservative Kaysville for its window display of—gasp—women’s underwear and nightgowns! Owner Christy Allen—also a major in the Army Reserve—opened the store to focus on giving women a wider range of bra selections than one can find at Victoria’s Secret or department stores. She stuck fast against requests to cover her shop’s windows, and has gained a strong clientele who now can’t live without Pretty You’s selection of bras for women on every point of the size spectrum. Thanks for the support! Sometimes the logistics of getting a broken-down bicycle—or the household’s entire fleet—to the bike mechanic is every bit as difficult as getting a dead car to the auto shop. Grease monkeys don’t generally do on-site work, but, luckily, now a member of the chain gang does. Troy Michaud brings his van to wherever a two-wheeler lies dead and gives it life anew—be it in Park City, where he is based, or in Salt Lake County. Who knew there were so many books in Bountiful? The Book Garden has packed its 4,000 square feet with books for every taste—from vintage collectibles to the latest kids, teen and adult best-sellers. Occasional huge sales mark down all adult fiction titles to $1, making it almost too easy to turn your “to read” list into a wheelbarrow full of books. One’s personal journey—or as mythologist Joseph Campbell puts it, The Hero’s Path—is one that is harder and harder to get on with each passing decade, what with big expensive toys (iPad, for example) to tinker with or Facebook to noodle on. Technology is one hurdle, one’s mind is another—and it might be the hardest to overcome. The sanctuary for conscious living, Golden Braid Books, can help with that. Since January, it’s presented a monthly educational series—facilitated by Tara Schofield—to discuss Jon Kata-Zinn’s Mindfulness for Beginners. At many a concert during the Jazz SLC series, hosted by the GAM Foundation, beautifully handcrafted guitars are on display in the lobby. Made in Cache Valley by Ryan Thorell, the gems include arch tops, flat tops, acoustic and electric guitars. But the lobby isn’t the only place they can be spotted: The biggest names in jazz guitar—including Frank Vignola, who’s been through town the past two seasons—are wont to pick Thorell’s six-strings.